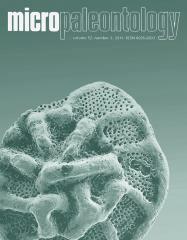 ABSTRACT: Foraminifers from the Upper Permian Bellerophon Formation, Permian-Triassic “transitional bedsâ€ and lowermost Triassic “streaky limestone memberâ€ of the Luka Formation in the Luka dection,western Slovenia are described and illustrated. Four new species of foraminifers are described: Multidiscus zhiriensis, M. dinaridicus and Globivalvulina lukachiensis from the Upper Permian, and Lingulonodosaria slovenica from the lowermost Triassic. The assemblage of Late Permian foraminifers consists of species characteristic of the Changhsingian of many regions in the Tethys: northwestern Caucasus, Transcaucasia, Iran, Turkey, northern Italy, northwestern Serbia, northeastern Hungary, and South China. Unfortunately, the uppermost part of the Bellerophon Formation in the Luka section is represented by dolomite and does not contain foraminifers. The Permian-Triassic boundary interval is represented by carbonate “transitional bedsâ€ deposited in a shallow restricted marine environment that contains foraminifers and conodonts. The species “Cornuspiraâ€ mahajeri, “Earlandiaâ€ gracilis, and “E.â€ tintinniformis, marking the lower boundary of the Triassic worldwide based on foraminifers, are found both below and above the first appearance of the conodont species Hindeodus parvus in the Luka section. These species appear to be ecological species and their appearance coincideswith a stressful shallowwater environment. The first intervalwith nodosariid foraminifers appears 2mabove the P/T boundary and a second one is approximately 5m above the boundary. Both of these intervals with nodosariids are within the range of the conodont species H. parvus and within the I. staeschei – I. isarcica conodont Range Zone.